The Joovy Caboose Ultralight Graphite with Caboose Rear Seat earned a 6th of 9 rank in this review. This stroller scored higher than average for maneuverability and quality, with a narrow footprint that can fit where no side-by-side option can go. The Caboose is an in-line option that is hard to use with an impossible to access storage bin, small rear canopy with no side coverage, and a two-handed fold that does not self-stand or auto-lock. The Caboose is also heavier and larger, making it a poor choice for those with limited space or lifting abilities. While this stroller is arguably an adequate sit and stand choice, it lacks the features parents need in an umbrella product and fails to offer enough elsewhere to make up for the lacking. The Zoe XL2 BEST v2 is smaller and lighter, and has the high score for ease of use, identical seating arrangements, and large storage. With a cheaper price and equal maneuverability to the Caboose, it is hard to recommend the Caboose in a category where weight and size rule. Joovy is a family company with locations in Texas and California. It was started in 2005, making it a fairly young company in the baby gear world. They currently offer a variety of baby gear products including strollers, play yards, walkers, and even bottles and other items for feeding. Joovy prides themselves on creating original designs using quality construction to create products that are fun and functional. We tested the Caboose with the second seat and included the purchase price of the seat in the total price of this double lightweight stroller option. The Caboose Rear Seat is sold separately, with a list price of $70. The Caboose is a sit and stand style stroller, seen here with the optional seat rear seat. The Caboose earned a 4 of 10 for weight and folded size. This stroller weighs 23.9 lbs and measures 11,382 cubic inches when folded. Only 2 strollers are heavier than the Caboose, and 5 were lighter, making it a poor option if space is at a premium in your car. The Zoe XL2 BEST v2 weighs only 19.7 lbs and measures just 9,145 cubic inches. While on the small and light side for a double stroller, it is one of the heavier and larger lightweight umbrella options. The Caboose earned a 5 of 10 for ease of use. This stroller scored lower thanks in part to hard to access storage and a two-handed fold. Alternatively, the Zoe XL2 BEST v2 earned the high for the metric with a 9. The Caboose is a two-handed fold that requires pulling up simultaneously on levers on either side of the frame (above left). It isn't a difficult fold, but the unfold is easier, by simply lifting the handle. This stroller does not self-stand and has a manual lock (above right). The Caboose brakes are average to set and release, and they are sandal foot friendly, even if they are a bit stiff. The Caboose has under seat storage that runs the length of the frame. It is medium in size and holds up to 5 lbs, but it has terrible access and we were not able to fit any diaper bag inside. The only access is between the seats (above left) and with a second seat and child in place, you will be fighting feet to get to the bin. This stroller also has a front seat child's tray with two cup holders (that did not hold any cups we tested), and a parent console made of neoprene with two cup holders and two pockets (above right). This is the only stroller in the review to come standard with a parent console. The canopy disparity on the Caboose might lead to arguments over who sits where. Each seat on the Caboose has a different canopy. The rear seat has a piece of nylon fabric that zips to the front canopy. This shade has no sides and goes straight across preventing taller passengers from sitting in the back seat. The front canopy is nicer and larger, with coverage to the knees, but it lacks a peek-a-boo window. The Caboose harness are easy to use, though more difficult to loosen than tighten. Both seats on the Caboose offer a 5-point harness. They have side clips that are easy to use for adjusting the crotch and shoulder straps, and the side straps are a double thread adjustment that is easy to tighten, but difficult to loosen. Rethreading the shoulder straps height adjustment is easy by pushing the tabs through the back of the seat. With the front seat fully reclined on the Caboose, the rear passenger will be able to pester the front passenger with ease. The passenger seating experience on the Caboose is different for each seat. The front seat has an adjustable leg rest with a rough seam at the end that may cause chaffing on the backs of little legs. The back reclines in 3 positions with a recline bar. The recline is good considering there is a seat behind it. There is no leg rest for the second seat, but it has a deeper recline adjusted with a pull tab on the back of the seat, that is a little stiff to move back and forth. The rear seat has limited legroom and feet dangle over the storage access point. We tested the Joovy Caboose with the rear seat and included the price of the second seat in the list price total for this double stroller option. The Caboose Rear Seat has a list price of $70 and is sold separately from the main stroller. 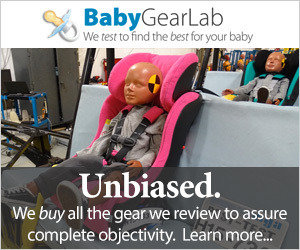 Britax, BOB, Chicco, Combi, Cybex, Evenflo, Graco, Maxi-Cosi, Nuna, Peg Perego, Recaro, Safety 1st, and UPPAbaby. We do not recommend using any lightweight stroller for children under 6 months old without the use of a compatible infant car seat carrier. Lightweight strollers do not have the features or design necessary to offer true protection from potential injury for passengers without head and neck control. The Caboose took almost 11 minutes to assemble and is the only one that requires a tool. The documentation is good, and the second seat comes with a quick start guide, but it is still more difficult to assemble than the competition. The Caboose earned a 4 of 10 for maneuverability. While this is a low score, none of the lightweight doubles scored over 5 in this metric. This longer stroller feels like a shopping cart and requires advanced planning for turning. It is harder to push, but turning is the real problem and the whole stroller feels stiff. The handlebar has flex when turning, but it can manage tight spaces better than double-wide strollers, as long as you don't have to turn. While none of the lightweight doubles were good movers, the Caboose did get the second highest score with a 4 of 10. This stroller has plastic wheels and all-wheel suspension. The handle is a good height for strolling and feels good in the hand with a nice foam cover. The seat has adequate padding and acceptable recline for the rear seat making the Caboose fairly comfortable for passengers and pushers. The Caboose earned a 6 of 10 for quality. While it has more flex and exposed fasteners than we like, it comes together fairly well for a sit and stand style product. This stroller has sturdy fabric that isn't soft, the frame has a simple design that is sturdy but has a utilitarian feel. The overall look and feel is average, but there are options in the group that feel more inspired and sleek. The manufacturer's video shows some of the more interesting features of the Caboose. Amazon $152.99 - 52% off!